Parking in Bachelors Walk for a birthday dinner in Uno's Italian Restaurant, I realised that there was another 45 minutes before the parking restrictions would end and the Traffic Wardens Attendants would go off duty. 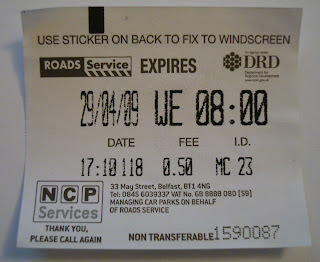 Putting money into the nearby parking meter - it's marked #23 if DRD, Roads Service or NCP Services are reading - I suddenly noticed that the expiry time wasn't incrementing towards 6pm. Instead, it thought the time was already the next morning ... no answer from the phone number marked on the ticket machine and the tickets. It just rang and rang and rang. No answering machine. Pity that NCP don't man their office to match the ticketing times. You can catch a quick review of Uno's on Lookaly. Update - turns out that if you overpay - which is inevitable as you pay in 15 minute increments, once the time goes beyond the 6pm cut off, the ticket and machine roll over and display the time that charging starts the next morning. BarCamp Belfast hit the Belfast Campus of the University of Ulster on Saturday. BarCamp Belfast is a user-generated unconference for designers, developers, startups and geeks to share and learn in an open environment. Unconference means that there are no fees to register and attend, food and caffeine are freely provided, there are no invited speakers but instead the attendees volunteer to give talks, organising the schedule on the day. BarCampBelfast - some highlights from Alan in Belfast on Vimeo shot entirely on a Flip Mini HD. Andy McMillan is the driving force behind the Belfast event, and along with a team of capable and obedient slaves, pulled off the event which had over 350 people registered before it started, thirty or more talks given across the day, and hundreds of networking opportunities for the participants who came from all across Ireland as well as a few from further afield. Traditionally, BarCamps are ... well, it’s difficult to use the word “traditionally” when it comes to a free-form event. So let’s say that many other BarCamp events are a hotbed of technobabble and rapid prototyping. But there were few hackers strutting - or even mashing - their stuff in Belfast on Saturday. Other than a few references to APIs, the majority of what I could hear was focussed on business development in the world of web design, project management, life coaching, managing clients to maximise satisfaction and profit. There were a lot of entrepreneurs, a lot of networking, and a teeny bit of self-promotion by some speakers! Of course none of that’s bad. In fact, the quality of the talks was incredibly good. It reflects the local market and those of us who are engaged with the event and its wider ecosystem. Looks like it’s a social island after all! Lee Munroe squeezed in a great opening session on the seven deadly sins of Wordpress and how to beat them - accessible and applicable to non-Wordpress bloggers too. Then he flew off to run the London Marathon! Paul Mcenhill talked about improving how we take, process and organise photographs: he’s still at school, but that didn’t reflect in the insight and tips he provided. Dee Harvey and John Campbell escaped from the darkened recesses of the BBC NI news room to start a conversation about the semi-permeable newsroom. 4iP’s Ewan McIntosh made it across from Edinburgh to educate more people about Channel 4’s Innovation for the Public fund, and share some of the progress on existing commissions (most notably, Audioboo). David Braziel looked at the top reasons that IT projects failed. Tracy Dempsey shared some insights into presentational techniques and threw in some NLP magic. And I left before ex-twitter-now-BT (or is that ex-San-Francisco-now-Whitehead?) Blaine Cook closed the day with a storming session that eschewed Keynote and Powerpoint in favour for the overhead projector (well, the modern lecture theatre equivalent) and hand-written slides. Even the coffee was geeky with Bean and Gone’s alien brewing kit providing tea and coffee on a scale worthy of an army field kitchen, but at a quality you’d find at the opposite end of the spectrum. Not having wifi proved quite liberating for the event, encouraging real life conversations and keeping people’s heads up from their laptops! An improvement - and one that can only come from within - would have been to have more talks. A shame that the four rooms weren’t booked solid all day, with talks overflowing into corners of the public spaces. (The bridge would make a great location!) More talks would have shrunk the numbers in some rooms, and perhaps allowed more interaction and conversation and less talk from the front. Maybe next time we need to encourage all of us amateurs to make sure that we pitch in with alternatives to the less-amateur outfits. I promise to think harder next year and come up with something to talk about. Davy Sims has already posted a podcast featuring interviews with attendees. And I’ll add a link to Davy McDonald’s video when it’s released over the next day or so. Not content with running a flourishing web design business of his own, promoting monthly gigs, representing the industry on the Digital Circle steering group and single-handedly keeping Charlies Coffee Shop’s profits healthy, Andy McMillan is organising Build Conference in the autumn: a “proper” conference with invited speakers, to be followed the next day by an unconference where the attendees get a chance to feed back to the speakers. And perhaps that’s where Northern Ireland will get to bring their TLAs out of their closets and talk openly about REST, SOAP, Ruby and arrange a vi-is-better-than-emacs re-enactment! Playing with a Flip Mino HD pocket-sized video camera. Between London Blackfriars and London Bridge from Alan in Belfast on Vimeo. Did you hear the one about the new local newspaper? We’re in the midst of an economic downturn. It’s a world where people are predicting the end of printed newspapers within a generation due to advertisers – who pay for, or at least subsidise papers – preferring to take their business online. So it was a bit of a shock to discover that just as I moved out of East Belfast in January, a new local newspaper was started. By chance I met Fiona Rutherford on Sunday morning, the editor of the East Belfast Herald. Selling in local newsagents, the paper covers local stories and activities and is very much a community publication. I remember driving past the Upper Newtownards Road offices of the East Belfast Observer on the way in and out of work until it closed a couple of years ago. If you’re an East Belfastian, look out for the Herald in your local corner shop. And if you’re planning an event or match in the area, or have something you want to advertise, I’m sure the team would be very grateful to hear what you’re up to. You can contact them on 90732114 or editor@ebherald.com. Good luck to the Herald. Off work last week, various plans came and went when the weather turned damp. But the Titanic Made in Belfast Festival had put the idea of a bus tour around Belfast into our heads. The Titanic Bus Tour looked good ... but the “not suitable for under sevens” in the leaflet was discouraging. But not - as it turned out - as discouraging as the pricing of the normal Belfast sightseeing tour prices! If you’ve every fancied taking one of the bus tours around the city, here’s what you need to know. At least, here’s what we found out on Saturday afternoon. Most of the tours will allow you to get off the bus (alight!) at stops of interest and then hop back on the next bus that passes and has room for you. There are twice as many red City Sightseeing Belfast buses as Allen’s Open Top tours, so you’ll only wait half an hour for the next bus when you tire of your stop if you buy a ticket for the red bus. Allen’s Tours claim four extra stops and exclusive access to Stormont estate. If you carry around a leaflet for one company, a sales guy for the other will offer you a discounted ticket! Anyway, wandering into the Belfast Welcome Centre proved a good move, as although the afternoon Titanic tour was sold out, the folk at the festival desk suggested queuing up outside the City Hall to see if some folk would not use their free tickets and we’d be able to fill the spaces. And sure enough at a minute past two, we were amongst the seven extra souls to slip onto the bus and set off on the two hour tour. Basically, it’s a great tour. Assisted by Denis at the wheel of the Ulsterbus, local historian and author Stephen Cameron guided us around Belfast, stopping to look at the Titanic Memorial under the shadow of Belfast’s Big Rickety Wheel, before heading off down towards the harbour Commissioners Office, the Abercorn Basin, the dilapidated Drawing Office, the slipway before finally reaching the Thompson Dry Dock and the Pump House. I suspect that Stephen could comfortably fill a week-long tour with details about the Harland & Wolff ship yards and stories about the building of the Titanic and her two sister ships, Olympic and Britannic. It was a fascinating insight into the scale of the venture, the world-class expertise that Belfast was able to apply, and the innovation that was dreamt up to overcome the obstacles in the way of building such a large family of ships. Sitting in church on Sunday morning, there was another reminder of the impact. Westbourne Presbyterian Church in East Belfast is sometimes known as the Shipyard Church, with the twin yellow cranes clearly visible from the door of the church. It was community Sunday, and a wide invitation had gone out to local residents as well as community representatives. Some of the church’s history and involvement in the local area was regaled, including the effect of the Belfast Blitz. But having only been on the titanic tour the previous afternoon, perhaps the hardest hitting moment was to consider the atmosphere that there must have been amongst the congregation on the first Sunday after the Titanic has sunk. Packed with men from the ship yard and their families. Knowing that three years of hard labour (and over three million rivets) between the keel laying on 22 March 1909 and the departure from Belfast on 2 April 1912 had been for nothing. The effect on the community is hard to comprehend. The once prestigious Drawing Office and Directors Board Room are now decayed. The once industrious slipway is waste ground. The dry dock still holds out the water, but is unused. Yet there is construction in the area. Just over the fence from the Drawing Office, Titanic Quarter is being built at a phenomenal rate. The first phase of the office blocks and apartments will be ready for occupation later on this year. The Science Park is a hive of activity. If you get a chance next April to hop on one of the bus tours, I’d recommend it. The itinerary may change slightly, as the building work will have started to excavate the old slipway and there may even be renovation work to the Drawing Office if any of the development plans come to fruition. Although I’ve been in Northern Ireland all my life, I either paid too little attention during history lessons (and gave up after third year anyway) or we didn’t cover a lot of local events. So it’s interesting to place some of these key influencing events in an NI context. Oh, and did I mention that the H&W on the yellow cranes stands for Hello and Welcome! More photos over on Flickr, and a review of the tour over on the Ravings From The Bog Dweller's blog. Remember Twestival? Well, another watery exhibition and fund raising about to spring up in Belfast. Launching on Monday night (20 April) at 6pm in the Art College Belfast campus of the University of Ulster is an exhibition of over 60 pieces of art all based around the theme of water. Water: Symbol, Element, Utility? is a collaboration between chaplaincy, students, staff and alumni. From architects to artists, exhibits range from textiles to photography, sculpture to fine art ... and even one piece of performance art. So why not pop along and explore the exhibition and see if you can spot any future Turner Prize winners! Prices for exhibits start at £30. 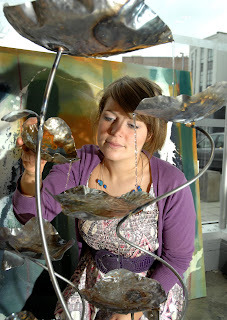 Speaking at the launch will be David Haley FRSA whose own art explores ecology and social justice. The exhibition is free, and will be running in the open ground floor area of the York Street building until the 30 April. Later in the week, local blogger Glenn Jordan is giving an open lecture on the Spirituality of Water as part of the exhibition. Friday 24 April at 12.30pm in Room 82A02 (on the ground floor next to the exhibition). Update - BBC news covered the exhibition online! I’ve tripped over yet another festival happening in Belfast. 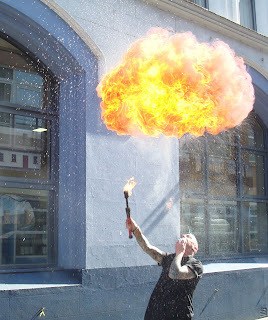 The Lord Mayor Tom Hartley was right when he commented that there are over 80 festivals in Belfast each year, and that as soon as one ends, another starts. 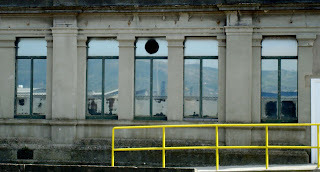 As the building work in Titanic Quarter progresses, and we head towards the 14 April 2012 anniversary of the Titanic hitting an iceberg and sinking, more and more energy is being pumped into raising public awareness about the history of the shipyards and its skilled workforce. The Titanic Made in Belfast festival runs from Saturday 11 to Sunday 19 April. Unfortunately, the main festival exhibition and many of the talks are being held inside W5 (at the Odyssey), so while the events are free, you must first pay the W5 admission charges to gain entry. There are also free bus tours around Queens Island, leaving Belfast City Hall daily at 11am and 2pm from 11-19 April. You need to pick up your free ticket from the Belfast Welcome Centre in advance. 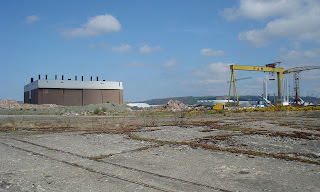 The two hour tour takes in the Harland & Wolff site, including the main offices where the Titanic was designed, as well as the Thompson Dry Dock and Pump House. If you want to see it from the water, 75 minutes boat tours leave Donegall Quay up to five times a day during the festival. £7 per person. And there’s more! Tours around the dock and Pump House, extended walking tours, and even a GPS-based audio/video interactive trail unit by that can be picked up for £5 from the Belfast Welcome Centre all year round. 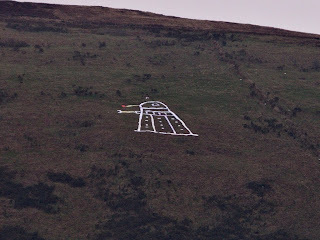 Driving across from East Belfast and onto the M2 on Sunday we noticed a large white Dalek on the face of Cave Hill Divis. Had one finally escaped from Cardiff? “There was meant to be a giant question mark beside the Dalek, but I ran out of bed linen,” said Denis speaking to BBC News. The giant Dalek took two days to make after Denis had ‘exterminated’ his family’s entire supply of bed sheets. Last year, the same organisers held a science fiction event in W5. This year, the prices have been cut down from £35 to £10, but you no longer get a free autograph etc. (Tickets are being sold online.) The convention isn’t profit making, and instead will hold prize draws and a charity auction in aid of the Northern Ireland Children’s Hospice throughout the day. Look out for the Ood (I can hear Murray Gold’s oooooy music in my head as type), Lady Cassandra (is she stretching herself thinly across conventions? ), the TARDIS, a Dalek and K9. At this stage, the guest stars expected to attend is Gareth David Lloyd (who plays Ianto in the Torchwood spin-off), Chipo Chung (acted in a couple of Doctor Who episodes) and Paul Marc Davis (who has appeared in Doctor Who, Torchwood and Sarah Jane Adventure). So if you’re wandering around the centre of Belfast, expect some strange sounds to emanate from Europa’s new conference room, and the sight of a few fans in fancy dress (they might prefer “dressed up in costume”) wandering around looking like they’ve fallen through the Void. Will I be there? While a Doctor Who fan, I’m not sure you could pay me to attend a convention! But I will be watching the new episode that will be shown on BBC One and BBC HD on Saturday (11 April) at 6.45pm - Planet of the Dead complete with a cat suited Wonderwoman Michelle Ryan and a London Bus. Friday lunchtime saw the Black Box packed out for the launch of the tenth Cathedral Quarter Arts Festival. 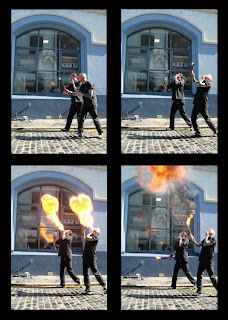 Outside on the street, fire breathers warmed up the already warm air, while inside more than a hundred supped their stew and listened as festival director Sean Kelly introduced the programme and teased the assembled audience with a taste of some of the acts this year’s festival would be putting on between 30 April and 10 May. 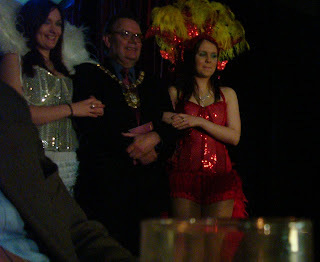 Lord Mayor Tom Hartley looked more comfortable than the dancing girls with feather boas who escorted him across to the podium where he delivered his welcome to the festival’s launch. The programme is available online as well as at venues, cafes and libraries across Belfast. Having warmed us up with the smaller Out to Lunch festival in January, the CQAF programme is packed with over a hundred events spread over a mere eleven days. Get Lost! - Belfast City Hall - While some may call it “the UK’s largest street theatre installation” if you turn up in front of the City Hall you’ll find a hedged maze inhabited by “a range of bizarre characters who guarantee a surreal encounter around every corner”, and those are only the local politicians trying to find their way into the still not reopened Council Chamber. Part of the Festival of Fools. John Baucher: Behind the Lens at CQAF - The John Hewitt - 30 April to 10 May - Moochin Photoman has been archiving the festival for nine years. His exhibition in The John Hewitt is surely worth a visit to catch a flavour of what John sees through his viewfinder. Chronicles of Long Kesh by Martin Lynch - Monday 4 - Saturday 9 at 8pm - back after a sell out run in the Waterfront in January, and recommended by many who went to see it. 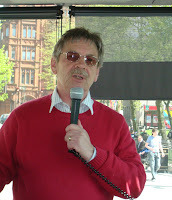 Talk Radio - Tuesday 5 to Thursday 7 May at 8pm - At the launch, Joe Lindsay previewed his performance as Barry Champlain, host of “Night Talk” radio show which is about to go nationwide at roughly the same time as he goes off the rails. From the snippet we heard, it’ll be a compelling one man show. The David Ervine Memorial Talk - Tuesday 5 May at 7pm - Eilidh Patterson, Gerry Creen and Anthony Toner will provide the music before an as-yet-unannounced speaker takes to the stage. In partnership with the David Ervine Foundation. BBC Blast on Tour - Wednesday 6 to Friday 8 May - The BBC Blast tour will be in Writer’s Square (in front of St Anne’s Cathedral and the Police Ombudsman’s offices. Offering teenagers workshops on all manner of creative media topics. Mark Thomas - It’s The Stupid Economy - Wednesday 6 May at 8pm - Sharp, incisive critique of the financial mess, dressed in a comedy wrapper. Mark Thomas reading from Belching Out the Devil - Thursday 7 May at 8pm - If live stand-up the night before isn’t enough, hear comic Mark Thomas read from his latest book as he “investigates the truth behind one of the planet‘s biggest brands”. Art in the Wars - Thursday 7 May at 7.30pm - Belfast was woefully unprepared for the air raids that caused great damage and loss of life during World War 2. This event in the NI War Memorial Building will tell the stories behind the collected murals and paintings, as well as sampling some of the classic poetry about the two world wars. Having sat with the organiser at the festival launch, I’m fascinated by the stories that could fill my gap in local history. Dave Gorman reading from America Unchained - Saturday 9 May at 2pm - Join Radio 4 and BBC Two favourite Dave Gorman as he explains what happened when he tried to drive across America from coast to coast only spending money with independent traders. And lots, lots more at cqaf.com. Get your tickets quickly ... it'll be a blast. Hands up if you knew that there was a cheerleading squad that trained on Belfast’s Sandy Row? 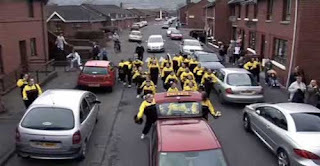 It was a couple of months ago that I first heard about the documentary Prods and Pom Poms that had followed the Sandy Row Falcons squad through their training for St Patrick’s Day parade last February and the Scottish regional championships in June 2008. And so it was back up to the quirky Studio Cinema above Belfast Exposed on Saturday afternoon to catch a rare screening of the local documentary as part of the Belfast Film Festival. If it’s used as a venue next year, the organisers will need to think about getting proper black out curtains ... the orangey-red glow as the late afternoon sun streamed in the back windows and onto the screen was less than ideal. The 55 minute film followed the journey of the coaches Lesley and Julie, along with the cheerleading squads as they train and perform. Lesley and Julie throw an enormous amount of energy into training up three age groups, the (strangely named) Pee Wees, Juniors and Seniors. Differing abilities, forgetfulness, absenteeism, as well as toddlers wandering across the practice hall all add to their stress and frustration. And the tension and feeling of impending doom ratchets up significantly as the industrially spray-tanned squads meet up early on a June Sunday morning to board a bus to the ferry and then up to the Braehead Arena just outside Glasgow: a venue packed out with more than a hundred cheerleading squads and hangers on. Will they make it to the venue on time? Will they fall out over platting each other’s hair? Will they make it to the stage on time for the first routine. Will their preparation pay off? Will they win any trophies? Their fund raising and fundraising and sponsorship obviously didn’t extend to going over the night before and being there for the full day; neither did it allow them to stay long enough at the arena to hear the results. So instead, they make a series of incredibly frustrating and comedic tense phone calls from the ferry to the hapless organiser … by the end of which they’re still none the wiser about the result. You’ll have to watch through to the end of the film to find out just how well they did! Prods and Pom-Poms from Höoptedoodle Films on Vimeo. The Sandy Row Falcons stuck out amongst the other competitors. They were a more honest squad, reflecting their community: it seemed unusual that the Belfast girls weren’t all pencil thin and blond haired like the Scottish squads. Enthused and encouraged by the routines performed by the other competitors in 2008, the Falcons will be heading back across to Scotland in 2009. If you’re on a ferry on Sunday 21 June and spot a squad of bumblebee tracksuits, that’s them. Wish them luck. After that, maybe they’ll end up cheering in front of an Orange lodge in the Belfast parade this July? Surely a more colourful and cheaper alternative to some of the bands? And as we saw in an informal moment during the film, they have the beginnings of a routine to accompany the Sash. As well as the cheerleading, the film also starts to follow the journey that the Sandy Row community are on in their relationship with the rest of Belfast. Imagery of painted bollards, murals and terrace housing sits alongside new apartment blocks and hotels sprouting up in the predominantly loyalist community. The squad’s decision to join in the city centre St Patrick’s Day parade now perceived to be neutral, but previously deemed too republican to watch, seemed significant. But if the film is lacking anything, it is a desire to explore more deeply the issues and tensions on the Sandy Row as it feels its way in a changing Belfast. Like another recent local documentary which looked at a North Belfast ladies darts team, Prods and Pom Poms is a compelling insight into a rarely exposed and little understood community. There are laughs, tears and much angst. Yet the film makers never seem to be taking advantage of or joking at the expense of the Falcons. It’s respectful, if honest. I can only imagine emotion and the atmosphere at the Belfast première of the film in January, when most of the squad turned up at the QFT to see themselves on the big screen. The squad should be proud of what they’ve achieved; the coaches should receive the city’s thanks (as well as New Years Honours); and the film makers Ben Jones and Paul Hutchinson from the intriguingly named Höoptedoodle Films should continue to hawk their documentary around film festivals and local broadcasters to ensure that a wider audience get to soak in the atmosphere and passion on the Sandy Row. 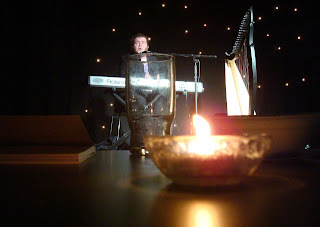 Check out the other reviews at Culture Northern Ireland and No Blog For Young Men. While the Northern Ireland Assembly and its committees and executive may normally meet up at Stormont in East Belfast, the Speaker and a subset of MLAs have been out and about on a roadshow that has been holding nine public meetings in different towns and cities. In both cases, they'll be serving tea and coffee at 7.30pm (no mention whether there'll be samples of Assembly Fudge) with the roadshow chaired by political journalist Eamonn Mallie starting at 8pm. There's no need to book a place. Just turn up to the venues. The website also allows you to ask questions in advance. Urban Hymns: The Movie ... Oh Yeah! As soon as I heard the Urban Hymns concert (part of the Belfast Festival) getting a plug on Sunday Sequence back in October, I knew it would be too late to get a ticket. Kan Haddock, Ciaran Gribben, Foy Vance, Duke Special and Bronagh Gallagher, accompanied by Inishowen Gospel Choir along with a packed out May Street Church. It was broadcast on Radio Ulster over Christmas – the evening of Boxing Day I think – but I missed it and it wasn’t available on iPlayer. Then recently, Stuart Bailie put the concert out again on his show ... and again, despite hopes ... iPlayer wasn’t the answer. But Belfast Film Festival came to the rescue with the première of Bandwidth Films / Will McConnell’s film shot on the night playing in the Oh Yeah! Centre on Thursday evening. The screening was slightly weird in that the sound came from the back, while the film was projected onto a suspended white sheet. There was method to this madness, but it was unnerving to watch artists and choir singing, and hear them over your shoulder. Louder sound might have boosted the intimacy and atmosphere at the otherwise relaxed screening. Shot using only two handheld cameras, there are few fixed shots and lots of panning across the stage, focussing in on a performer before shifting attention elsewhere. It felt like being there at the concert, constantly distracted by people and details, glancing all around, every now and again coming back to look at the main singer. The focus is fairly light at the start of the concert, but felt significantly sharper by the second half. Overall it was an unusual style, yet one the really captured the atmosphere (I imagine) of the original concert, and a technique done so well it would be worth pointing out to the Tech Campers in the summer. Done badly, it could have been awful; but done well, it was fantastic. If you do ever get to see the film, look out for the beautiful tracking shot during one of Duke Special’s songs, examining the faces of the front row of the choir. Musically, it was great. Foy Vance’s cover of Hallelujah! was memorable. Despite the upbeat name, it’s always a depressed and melancholy song, and Vance’s scrunched up gurn particularly impressive. Bronagh Gallagher was the only woman on the line-up, and yet she stood out not by gender but by being the most extrovert of all the performers. Duke Special achieved a lot with a few thumps on the piano and using the choir as his backing band. Now I can see why people flock to his concerts. 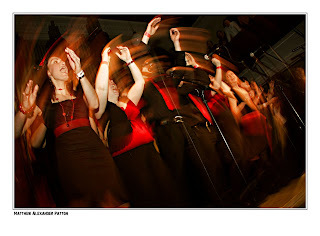 The Inishowen Gospel Choir were on their feet for most of the night. Some made it along to the screening, and got to see what had been going on behind them up in the pulpit (the stage for the soloists) while they sang their hearts out. It’s a shame that more people didn’t come along to the screening. But a lovely evening, and a really well put together film that’s a great advert for the talent of Will McConnell and Bandwidth Films. 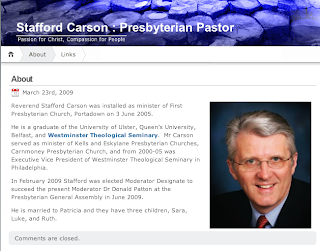 Stafford Carson became Moderator-elect of the Presbyterian Church in Ireland back in February, when each presbytery in Ireland met for their annual vote. He doesn't get sworn in until General Assembly meets in early June, but in the meantime, he's started a blog, together with a rationale for why a minister should blog. It'll be interesting to see whether this will be the year of the blogging moderator, and whether the denomination will eventually host a moderatorial blog on presbyterianireland.org, one that rolls over from one moderator to the next as the years go by? In the meantime, Stafford is posting away on one designed by a local Richhill web design company Red Rhino. If I'm being pernickety, it has a quirk on the About tab which gives Stafford's bio in the third person ... always a sign that someone else set up a site! As mentioned last week, the Belfast Film Festival has been in full swing. When the festival programme suggested that a film would be shown in Donegall Street, I wondered if they’d got it right! But sure enough, up above the Belfast Exposed gallery, up above NvTv, right at the top of a lot of stairs, there was tiered seating and a projector on the ceiling in the Studio Cinema. It turned into an evening where an IT architect gate-crashed the world of the built environment and more traditional architects. 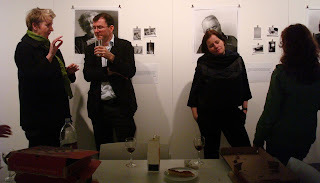 The festival event was based around Ireland’s entry into the 11th International Architecture Exhibition in Venice back in Autumn 2008. Without getting all artsy, in curating the exhibition Nathalie Weadick and Hugh Campbell avoided concentrating on buildings, and instead reflected the use that people made of the space within the buildings. Hence the title - The Lives of Spaces. 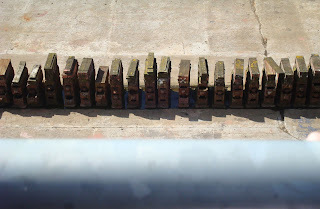 Photographs and models of buildings are very static. So instead, they commissioned nine pieces for the exhibition that instead used film to show off the spaces and the lives they supported. Most came from architects, teamed up with a film-maker, to realise their vision of a particular space. The spaces were all quite different. Looking through the windows and up the hall into rooms in a bungalow, inter cut with family photos and amateur footage of a wedding reception that had been held in the home. Contrasting the empty Waterford Library in its pristine, just-finished state with the book-laden people-rich environment once it had opened. Comparing the spaces created by “two recently completed urban projects - one in Milan and one in Dublin”. Projected onto the big screen, the 24-like multi-screen effect entranced while the soundscape helped tell the story. Overall it was a celebration of the communities that constructions support. Not about the pure beauty of the architectural form, but the opportunities and potential unlocked. And it made me think about the parallel tendency in the world of IT architecture to fall back on basic static designs (with lots of rectangular boxes and lines between them to represent the systems and interfaces), forgetting that it’s all about the people using the solutions and the opportunities and potential unlocked. Clips interspersed with Nathalie and Hugh’s background info. 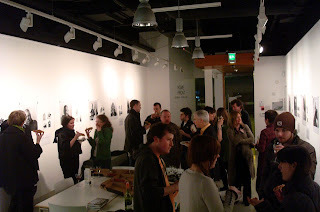 The full exhibition is coming to Ormeau Baths Gallery in February 2010, and after Wednesday night’s taster, it’ll be worth going along to see: to interact with the different pieces and explore the creators’ spaces. The talk and screening was sponsored by PLACE (they have a blog) – a project run by the Royal Society of Ulster Architects (RSUA) and Belfast City Council (BCC) which aims to promote good design while raising standards and best practice by educating architectural types as well as the general public who work and live in the “built environment” they are paid to create. You'll have stood beside the door of PLACE if you've queued at the hole in the wall at the back of Boots in Belfast. Or wondered what happened to the old back entrance the old Ulster Bank branch that turned into Belfast Welcome Centre. And it was back to PLACE afterwards that we headed for pizza and discussion. Bet there aren’t too many films in the festival with free food! 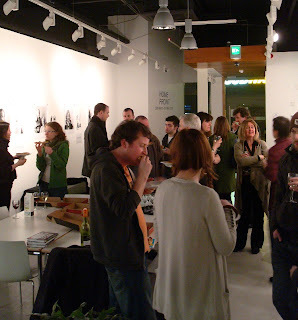 I posted about Five Minutes of Heaven and its cinematic première in Belfast back in February. Now it's the turn of the small screen, and Five Minutes of Heaven will be broadcast on BBC Two (network-wide, not just locally) on Sunday night at 9pm, depicting how the lives of Alistair Little and Joe Griffen (played by Liam Neeson and Jimmy Nesbitt) overlapped during a brutal UVF shooting in Lurgan, and how their paths converged years later in an opportunity for reconciliation and possibly revenge. It'll be interesting to hear what English, Scotish and Welsh audiences (I wanted to say "mainland" but I chickened out) make of it. I suspect a lot of the subtlety will be completely lost on them, and they'll see it as a psychological piece with two actors they recognise and a lot of emotion and angst. But for local audiences - and particularly in light of the recent resurgence in violence - it will tell a more haunting story of pain and consequence. These are my personal views and not those of any client, employer or other organisations I am involved with. All un-quoted text and imagery in my blog is licensed under a Creative Commons Attribution-Noncommercial-Share Alike 2.0 Licence.